The General Electric engine that will exclusively power Boeing’s new 777X has completed its first test flight. 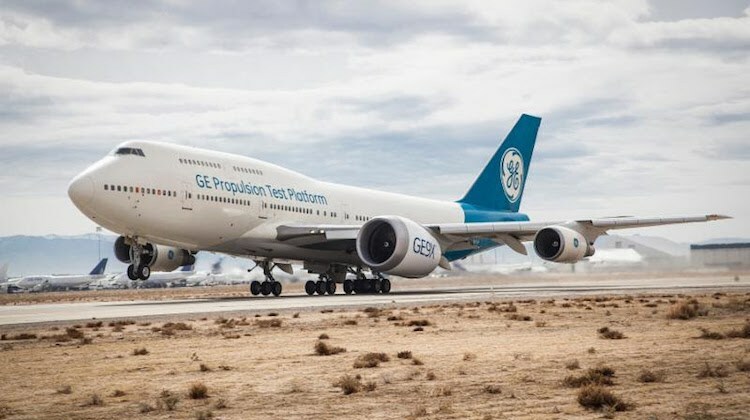 GE Aviation’s 747 flying testbed with the GE9XTM engine on the wing took off from Victorville in California at about 1040 on Wednesday (US time). During the four-hour flight, the aircraft and engine “completed the entire test card and validated key operational and functional characteristics enabling the test campaign to progress in subsequent flights”, GE Aviation said. “The GE9X and Victorville teams have spent months preparing for flight testing of the engine, and their efforts paid off today with a picture-perfect first flight,” GE Aviation GE9X program general manager Ted Ingling said. The full flightpath can be seen on Flightradar24′s Twitter feed. The first test flight is the latest milestone in the GE9X engine program that kicked off in May 2017. The engine has also undergone icing tests in Winnipeg, Canada and crosswind testing in Ohio. The program is forecast to receive certification in 2019, GE Aviation said. Built with a composite fan case and carbon fibre composite fan blades, the 134-inch diameter GE9X engine is designed to deliver some 105,000lb of thrust. Other key features included a next-generation 27:1 pressure-ratio 11-stage high-pressure compressor; a third-generation TAPS III combustor for high efficiency and low emissions; and CMC material in the combustor and turbine. IHI Corporation, Safran Aircraft Engines, Safran Aero Boosters and MTU Aero Engines AG are also participants in the GE9X program. It will be used for Boeing’s 777-8X and 777-9X, which have received 326 orders from eight customers since it was launched in 2013. GE Aviation said there are almost 700 GE9X engines on order. In addition to new engines, the 777-8X and larger 777-9X also feature new composite wings with folding wingtips to maintain its Code E rating at airports, as well as in-cabin enhancements such as larger overhead stowage and a wider cross section. The 777-9X is 77 metres in length, has a total wingspan of 72 metres and is capable of flying 7,600nm when carrying 400-425 passengers in a two-class configuration according to Boeing figures. Entry into service is scheduled for 2019. While the 777-8X is still in development and yet to reach firm configuration, the Boeing website lists the aircraft as having a range of 8,700nm and a passenger capacity of 350-375 passengers. The aircraft is expected to enter service in 2022. Airbus’s candidate is the A350-900ULR. VIDEO – ground testing of the GE9X began in 2016, while this 2017 shows the engine undergoing icing tests. The engine is so big it almost looks photo shopped! Well it look like it ticks every box in improving thermodynamic efficiency. has to lower the cost of flying to the end user ?? Interesting it’s ‘only’ 105,000lbs. I would have thought with the longer 777X they would be looking at 125 or even 130,000lbs. Guess they don’t need more power when the plane itself is lighter. With that huge engine dwarfing the other three, little wonder the flighttracker shows the 747 going round in circles!! Why not build a 747 Max with 4 of the new engines? That looks like the diameter of a 757 fuselage! With this engine on the 747, they should only need two of them because the 777 is almost as big as 747 anyway… A massive engine with massive Power for massive planes… The future of Flight is looking set to get even bigger… Makes you wonder just how big they can go….? Personally, I think the A380 came out a little too soon for real success but it has Boeing on their toes and getting more competitive – but then, that’s what it is all about. By trying to be one step ahead of the competition, manufacturers are always improving their and the airlines and their passengers are the beneficiaries. The more fierce the rivals the better the products they produce… But there is a downfall? The more costly the products tend to be and more complex as well. This can in turn lead to industrial espionage and the cutting edge of technology gets that little bit sharper. GE, RR and P+W going one better than each other with different engines just adds to Boeing and Airbus producing the best planes that money can buy, but at what cost??? More merges in future as costs get too high for a single manufacturer forcing them to merge or die. The Jobs and the skills that go with them are key to success for all involved in the advances in technology that comes out of it.